This book was obviously meant to be anti-Carter, based on the subtitle and the short length (at less than 250 pages before the index, I was disappointed), but it seems to be accurate. Having been born in 1980, I am fascinated by the 1970s, and I find Jimmy Carter more interesting than Bill Clinton, whose presidency I grew up in. Carter appears to be a sincere Christian, and more principled than Bill Clinton--it's just that he has different faults. 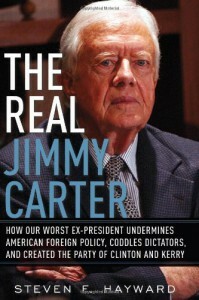 Instead of being a weak man of appetites, Carter is principled, but is also arrogant and self-righteous, to the point of interfering in the diplomatic affairs of presidents Reagan, Clinton and W. Bush; but his being principled obviously didn't help him conduct an effective presidency (for crying out loud, the author relates in this book that Carter had a bunch of average people flown to Camp David so he could ask them what to do); and the author claims that despite being Christian, Carter is generally a malicious person, and eternally bitter about losing to Ronald Reagan in 1980. This is a worthy book, but don't make it the only biography or criticism of Carter you read. If you can find it, read the out-of-print book *The President Who Failed: Carter out of Control*, by Mollenhall, written in or around 1980.